What are we taught in the gospels about money? Jesus taught about money or riches quite often. I won’t cover everything he said but I want to attempt to discover a pattern of his teachings. 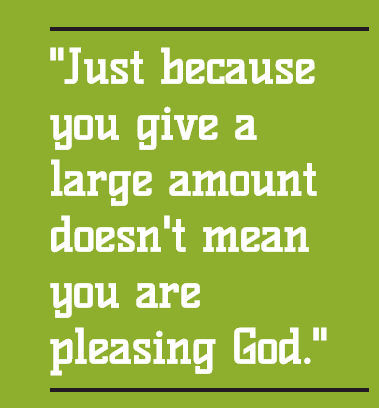 Just because you give a large amount doesn’t mean you are pleasing God. Just because you ‘tithe‘ doesn’t mean you are pleasing God. Giving small or giving large – God knows your heart. The poor widow was actually being plundered by the religious leaders. Be sure to read The Truth About the Widows Gift. That kind of sacrificial giving is NOT a model for Christians. Unfortunately, the same thing is happening in churches right now with messages to poor folks telling them the must ‘tithe‘. It is wrong for religious leaders to plunder poor folks by telling them they must ‘tithe‘ to please God. The message Jesus gave to the Pharisees who plundered the poor is appropriate for religious leaders that plunder the poor now. In Matthew 19:16-26 Jesus is asked a question by a rich young man. This young man said he had obeyed all the laws but wanted to know the one thing he had to do to get eternal life. Jesus saw through the young man’s question and went directly to the root of the problem. The problem was that the young man loved his riches above everything else and wanted to hold onto them. The answer for the young man’s problem was not tithing. The rich young man needed to do as Jesus said and sell all his possessions, give the money to the poor, and follow him (Jesus). What does that mean to us now? What should we understand from this lesson? Is Jesus saying that everybody ought to give all they have to the poor? I don’t think so. Those that have the same problem as the rich young man may need to take the same cure. In both of these situations, Jesus clearly indicates that tithing is not the answer to two extremes of money problems – those with very little money and those who have a lot of money. How about everybody else? Maybe ‘tithing‘ is for those in the middle of the two extremes! Absolutely not! Tithing is not the answer for any money problems. Actually, based on Jesus’ words, the fact that some Israelites faithfully gave a tenth of their income did not mean that God was pleased with their offering! Even when the tithes did what they were supposed to do doesn’t mean that the giver was storing up treasures in heaven! That part is no different now. Just because you faithfully ‘tithe‘ is no indication of God’s acceptance of it. Yes, some of your ‘tithe‘ may help keep the local church operating but don’t take comfort in that. We are told in Matthew 7:21-27 that many people will do a whole lot better than just tithe and even they will not enter the kingdom of heaven. So what are we supposed to give? More important than the question of how much to give is the question of how to give it. We need to learn how to be cheerful givers not be reluctant to share with those in need – 2 Corinthians 9:7. More on that later. For some reason, many people associate tithing with being generous. Tithing and generosity are not the same. A person can tithe and still not be generous in his or her heart. ‘Tithing’ for Christians is an attempt to please God by obeying one of the laws he gave to the Israelites. The law of tithing is no different than the laws the Israelites were given that instructed them to kill animals and sacrifice them to God. God sent his son ,Jesus, to be the final sacrifice for sins. God set all the laws including the Levitical priesthood aside because they were no longer needed. The laws did what they were supposed to do until Jesus came and fulfilled the prophecies that were written about the first coming of the Messiah. Jesus explained to us in Matthew 22:36-40 what was important about the laws God gave to the Israelites. This is repeated in Romans 13:8-10 and Galatians 5:14.